Junk Food Jungle Tactics are easily deployed to stay on the right side of Health. You know what is right, but a clever food industry has made it harder than ever. Today most foods you buy are processed, and as such ‘junk’ for your body. 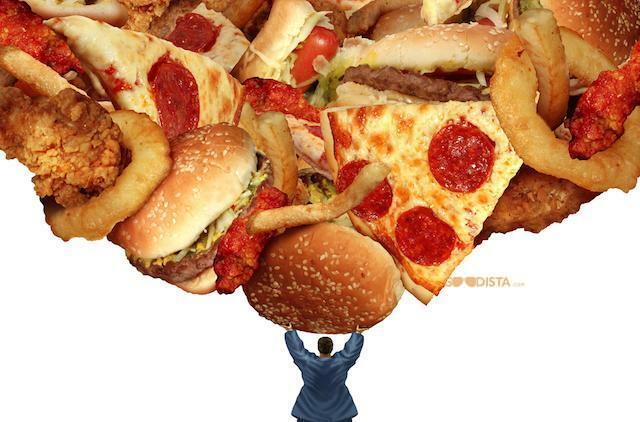 Processed or Junk Foods are a jungle of unquestionable health issues and discussions. To stay healthy you need not be a stealth Eco-Warrior. You simply need these 10 easy common sense Junk Food Jungle Tactics. Feel free to comment, share and join our mailing list. Junk Food (which also means waste, garbage, and rubbish), refers to their low nutritional value. Junk or Processed Food is high in calories, sugar, fat, and salt. Processed foods also contain additives, flavor enhancers, coloring, and genetically engineered ingredients. To get yourself into Junk Food Jungle Tactical mode, you need to get to know The Good, The Bad and The Ugly. Mother Nature made what the body recognizes as food – Real Food. These are Whole Grain, Vegetables, Fruit, Egg, Milk, Meat, Chicken, Fish, and Seafood. Good Food is Real Food. Included is also honey, raw sugar, natural sea salt, spices, olive oil, nuts, dried fruits, and full-fat natural dairy. Be extra careful with Snacks, Soft drinks, French fries/Chips, Processed meats, Candy, Desserts, Cereal, Frozen foods, and Classic Fast Foods — these foods are highly processed and where additives are frequently found. Know that your body does not recognize them as food. Therefore, your body will not know how to properly digest these foods. Eating processed foods can cause long-term damage to your health, particularly with regard to organ damage. The additives are synthetic and many have drug-like effects. The outright Ugly is The Big No-Nos. The worst culprits to our health are harmful additives which include: Artificial sweeteners, including aspartame; Monosodium glutamate (MSG) and yeast extract; Trans fats: partially hydrogenated oils; Nitrites and other additives to processed meat; High fructose corn syrup (HFCS); and Allergens. It is noteworthy that these ‘ingredients’ are in most kid’s favorite cereal, snacks, and foods. Children can develop allergies, learning disabilities, hyperactive nervous conditions if these additives are eaten too often. Click on each of the links above for additional information. Junk Foods and Real Food. This should be your main principle. Real Foods are Vegetables, Fruits, Whole grain, unrefined salt, raw sugar or honey, spices, natural dairy products, farm breed chicken and meat, and non-farmed fish. The rest is more or less processed. Let Real Food become your main guide when you shop or order out. If you want to read more about Real vs Unreal Food, Michael Pollan’s Food Rules: An Eater’s Manual is a real treat to digest, and makes light of a difficult subject. Fresh Foods is what you want, and they are at the perimeter of the supermarket. Vegetables and Fruit are often the first you see when walking into a supermarket. Ounce by Ounce, and Gram by Gram it is cheaper and healthier to pick them yourself, rather than buying them ready-cut, or plastic wrapped. Get your bread, fish, chicken, and meat from the bakery, fish and butchery counters – and think of them as separate stores. Ask the staff for whole grain, non farmed fish and farm-breed chicken and meat. The processed goods are in the inside aisles, so stay clear unless you know your labels. When buying packaged or processed foods, look for ingredients that you recognize or know. Avoid any foods with too many ingredients. If you cannot understand what these are, or even pronounce them – ask yourself if they are good for you. Rule of thumb is to avoid any foods that have five or more ingredients as these are likely to be preservatives, refined sugar and salt, poor quality oils, and other additives. Label reading takes a bit of learning, but you will soon get used to it. To get off your salt and sugar addiction and Children’s natural wish to have candy, sweets, and cakes find recipes that can satisfy the sugar & salt cravings. Make it special and fun. Check out The GOODista for healthy alternatives for those ‘must-have’ moments. Stay away from fast food restaurants as much as you can. When you go to a sit-down restaurant, try to order meals like chicken or fish, cooked or steamed vegetables, salad, or anything that is as close to its natural form as possible. Make a fun day each week to make dinners and freeze. Get portion packs and save time later in the week ( See below for great storage boxes). You will know what you eat, and less likely to order takeout if you already have a nice, healthy meal at home. Better for you – Better for your Budget too :)! Cooking healthy for Children may take a bit of practice — and children can be picky with ‘the green stuff’ — so it is worth investing in some new and clever cookbooks. Click on the highlighted link above for ideas. Look at the food you have at home. If you want to be healthier, be honest with what you are eating now. Decide to get rid of any processed ready-made ‘food’ that is in a box, container, or can. These items are all full of preservatives and loaded with sodium. Make sure you donate it to a food shelter or eat it in smaller doses until it’s gone, and you are mainly eating whole real foods. Gather healthy recipes. Look online for “The Mediterranean”, “Primal” or “Paleo” recipes, which use only whole foods. This is the easiest way to eliminate processed food from your diet. You can also get great inspirational cookbooks. (Check out below some that The GOODista recommends). #10 Last but not Least: Lead by Example! Remember when your parents told you not to smoke while puffing on a cigarette? You need to hold back on your own fast food and take-out meals too, so that your children will learn and understand that these are foods to only eat now and again. It is so easy for our generation to fall back on what we perceive to be time-saving, great tasting foods. With more understanding of what Real Food is, and how you can start living a healthier life, you can use your Junk Food Jungle Tactics also on yourself. Check out the guide below and Feel Good about your New Healthy You! If you have some tips that you want to share on how we can deploy Junk Food Jungle Tactics, please use the comment box below. Join The GOODista for more inspiring posts about lifestyle changes you can do — every day and when working away. What a great guide, thank you! I get inspired, and keep telling my friends to also follow you!